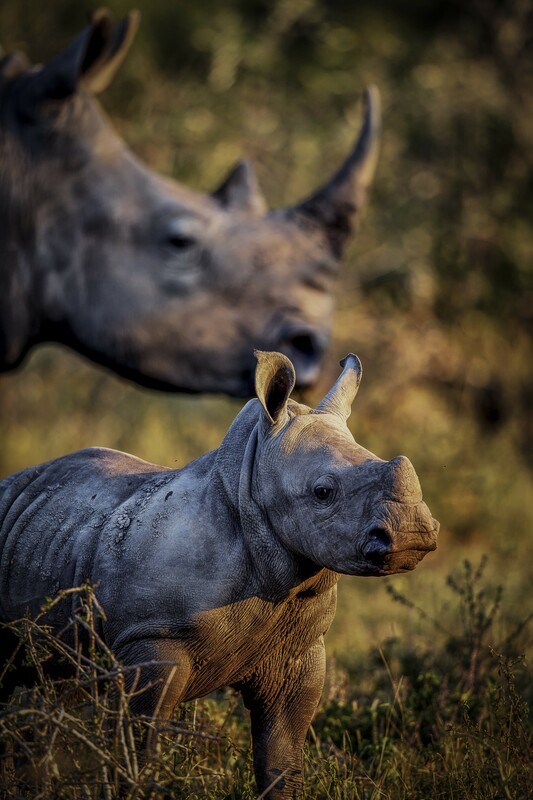 Image courtesy of Chris Fischer. 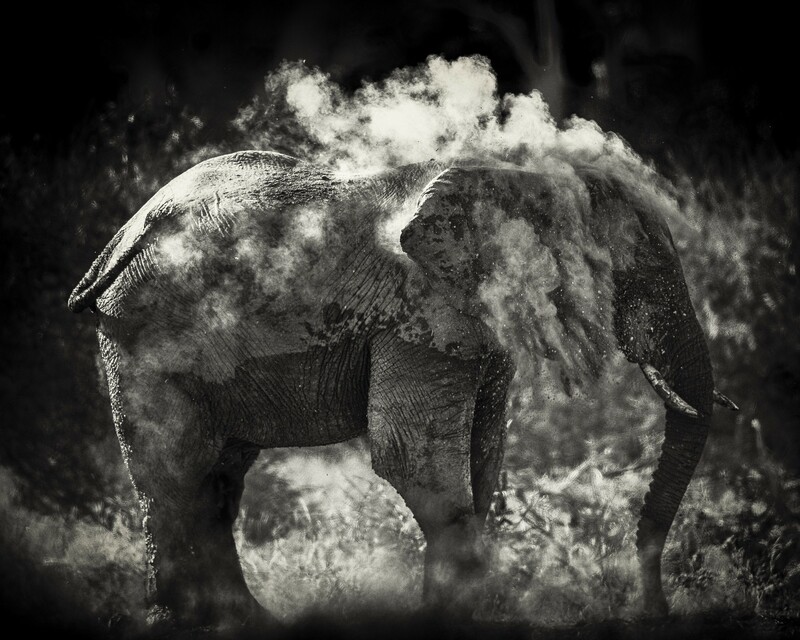 WILDLIFE PHOTOGRAPHER Chris Fischer doesn’t often go to work at a studio. 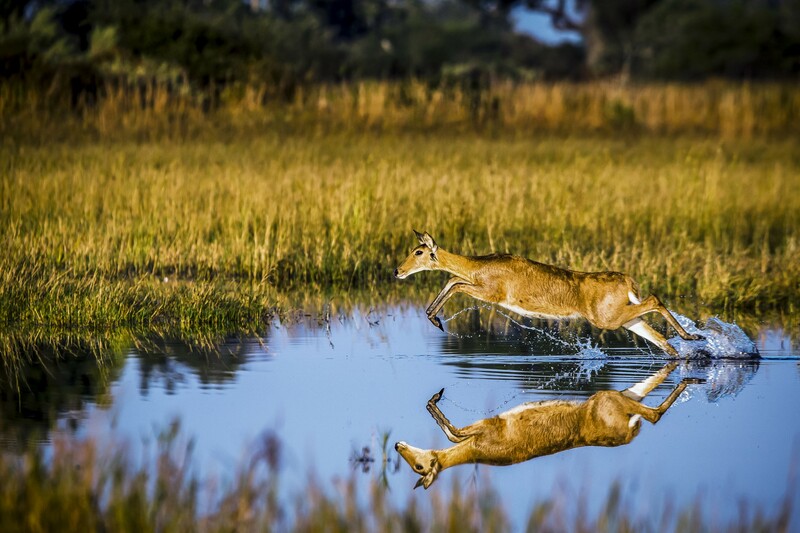 He travels the long distance from his home in Oregon to shoot in Botswana, South Africa, and Tanzania, sometimes following his “prey” for seven days before getting the perfect shot. He says that while nerves of steel do help, cool decision-making under pressure is a much more important tool for the wildlife photographer — he’s woken up to find a hippo leaning up against his flimsy canvas tent, and another time, had a lion chased through camp by a much larger lion while he and his companions breakfasted. He’s preparing to share the results of a recent trip with a new fine art photobook. For Polarr, Emily von Hoffmann spoke with Fischer about the project. Emily von Hoffman: Can you tell us about the animals and areas photographed in your upcoming “And in That Moment”? 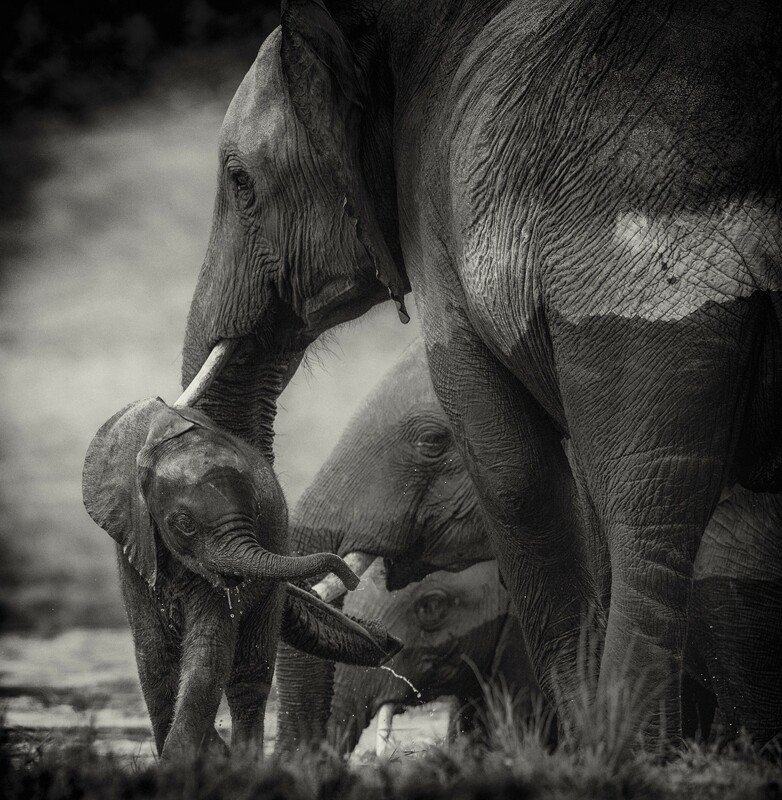 Chris Fischer: All the work for the upcoming book takes place in Africa with a healthy mix of Botswana, South Africa and Tanzania. I tend to focus on the larger species like lions, elephants, leopards, cheetah, rhino, buffalo, etc., but the book won’t be exclusive to them. Smaller or less common animals also have their place, but I’ve found that it’s difficult to find them in good light, so it takes a good deal of patience to capture something worth using for a project like this. I have been lucky to see some of the smaller or less common animals, but good images can be hard to come by. One evening in the Tuli Block of Botswana we were out picnicking and had a small elephant shrew stealing bits of our snack. I quickly grabbed my camera and was able to capture a few images of him but again these are more images of chance, not planning. EvH: How did the idea for this project arise? CF: This has been something of a fluid idea for a few years. Years ago I toyed around with the idea of doing a book based on some of my street photography work, but nothing really materialized. For a while I worked on creating a body of work based around the street dogs of Belize. They have a big problem with stray dogs there and they roam the streets with nowhere to go at night. I worked on it over a few years, but I never felt like I had a good amount of images worth using. It wasn’t until we returned from Africa in 2013 that the idea came back to me with any seriousness. I have always wanted to put a project like this together to essentially build a baseline for work moving forward, but developing a strong body of work does take considerable time and energy. EvH: How did you decide on the particular areas pictured? CF: The locations I use tend to be areas that have a high likelihood of photographic success. Not all areas are created equal, in terms of both landscape and sightings. I do a great deal of research prior to planning a trip to make sure that we are spending as much time as possible in areas that will allow for the highest chance of both good sightings and great background landscapes. 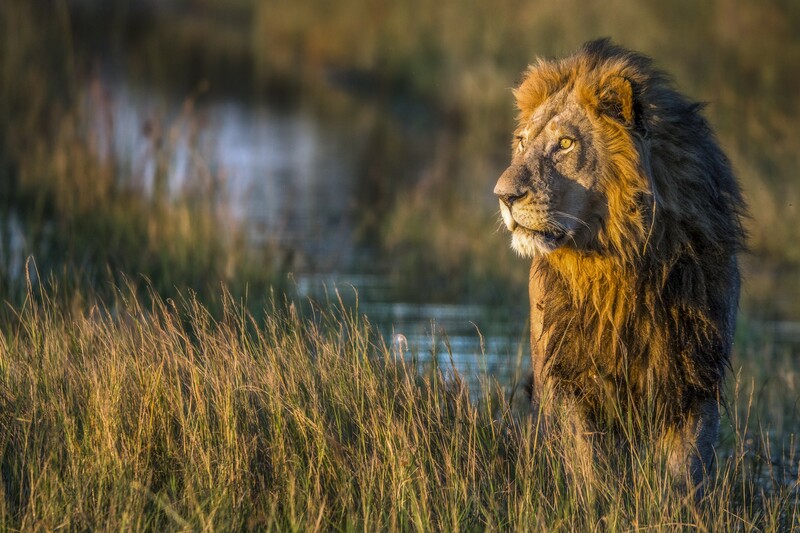 For example, we traveled to a remote corner of the Okavango Delta last year in search of very specific lion sightings, because that area was famous for what we wanted to see. However, I will typically always sacrifice scenery for good animal sightings if I need to choose. Luckily, I have not had to make this decision much so far. In the end I am dealing with wild animals that have a mind and life of their own. There are never any guarantees when heading out there, you simply have to stack as many cards in your favor as you can and cross your fingers. EvH: How did you begin practicing wildlife photography? CF: The earliest memory I have of photographing was in Alaska with my dad on a fishing trip. I was 10 at the time. I had no concept of ISO, shutter speed or f/stop. I simply found the idea amazing: capturing a moment in time, frozen forever. I never really gave it much thought or really photograph much at the time, but every year we went up there, I would have a camera with me. It was quite a place to cut your teeth on photography. I gradually learned the trade over the next 9 years a week or two at a time. I have been closer to bear than I would care to recall, seen a super pod of orca, humpback whales breaching and seals within inches us. I don’t really know the exact moment, but I fell in love with wildlife in Alaska. It wasn’t a typical childhood experience, especially not up there, and not nowadays for sure. Most of my days were spent fishing, but even then I was more concerned with taking photos than I was with catching fish. After we finished fishing for the day Dad and I would take off and explore, and I always had a camera with me. I’m not sure that it was ever a super conscious decision, but it happened. EvH: Did it become clear immediately that it was your preferred genre? CF: That is a tough one. That time in Alaska was definitely influential in my life. I have always had such a great respect and love for it, but never realized what that would lead to. At the age of 23 I really started moving more into street and portrait photography traveling to Guatemala, Belize and Cuba among other places. I became fascinated with capturing simple scenes depicting the quiet moments of life. I really began to enjoy finding the beauty in the quiet. 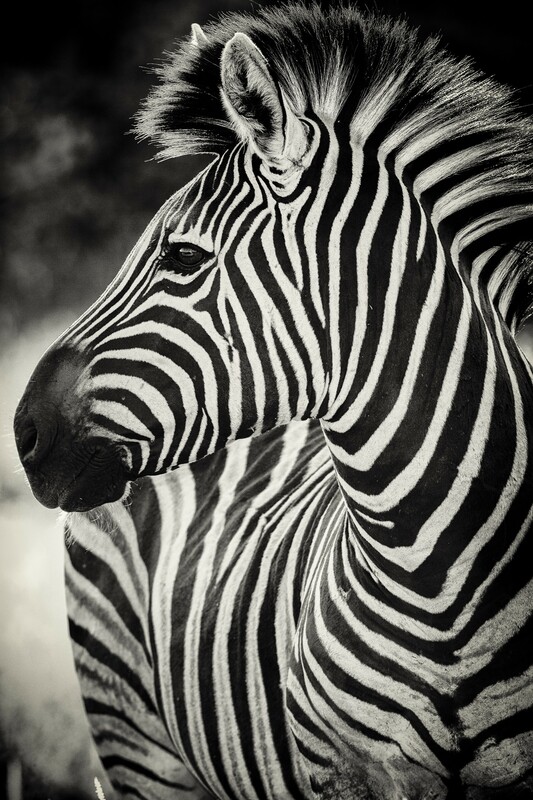 It wasn’t until I moved back into wildlife photography that I realized how powerful that blend of styles could be. I really do believe that if I had not spent so much time working in street and portrait photography that I would not have the same perspective on wildlife photography. EvH: Can you tell us more about your early experiences in Oregon and Alaska? CF: Truly, I have very few early photographic experiences in Oregon that I really remember. We camped and hiked as kids. I always loved seeing new landscapes and developed a love for wide open spaces. Unfortunately, here in Oregon, we don’t really have that diverse fauna that you get someplace like Africa. We get elk and deer, and some smaller predators like fox and coyote. Alaska is a different story all together. That is rugged true and untouched wild. The air smells different, soft and crisp. It’s one of the last strongholds of the giants of North America. The landscape is epic, mountains rising straight from the sea, wide open plains and dense old growth forests. We spent so much out there in that little stretch of South East Alaska became like home. I used to be so good at finding bear that we could routinely find 3–5 bear a night. In fact, working up at the lodge we used to have guests pay us to take them out bear watching in the evenings. EvH: Can you please describe one or two of your favorite images from the collection, and the situation surrounding them? 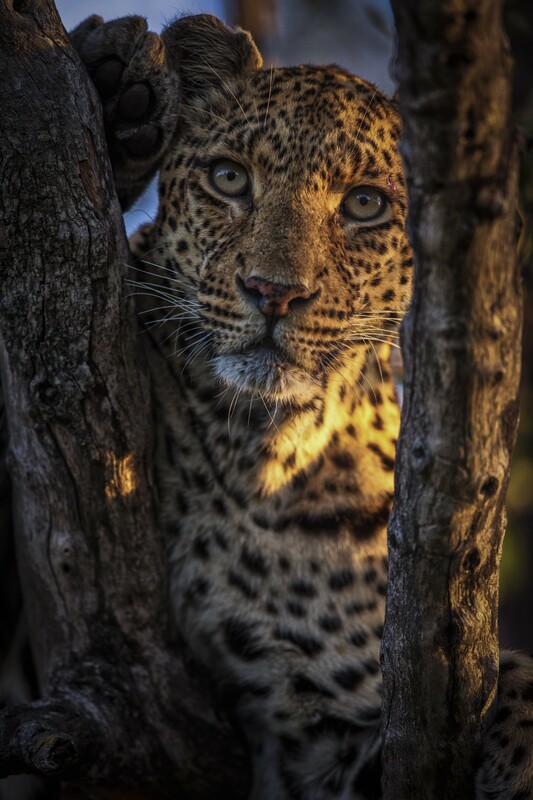 CF: “My Beautiful Girl”— We had been tracking a male leopard for an hour or more early one evening. We had been with him a few hours that morning and were able to catch up with him again that evening. It started out relatively uneventful; it appeared he was only patrolling his territory. Finally, he came to a rest on the edge of a dried up river and rolled over as if he was about to take a nap. Out of nowhere there was a crackle on the radio and everyone went silent. We were all alone down here, yet Matt, our guide, appeared to get really excited. “To our left, to our left” he said with a bit of urgency and a great deal of excitement. 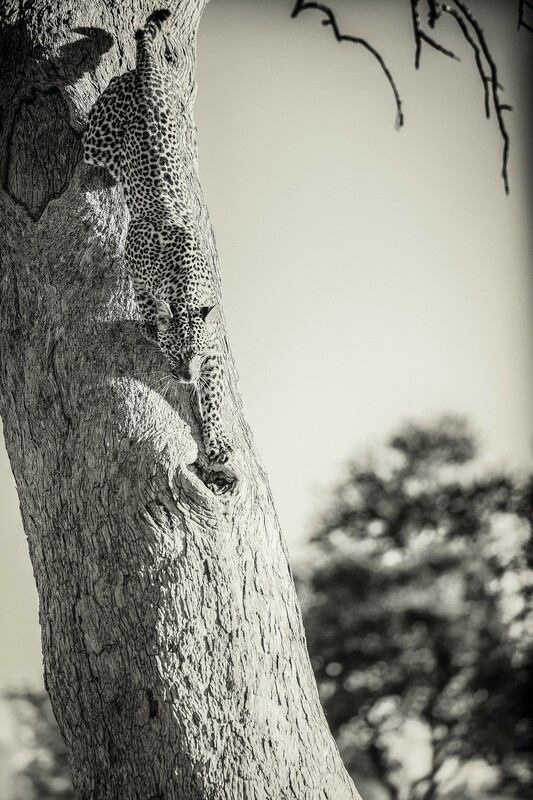 Within moments, a smaller female leopard appeared at the crest of opposite river bank, completely unaware of the male leopard right next to us. Within seconds the male caught her scent and was on the offensive. He crept as close as he could, perhaps 50 yards or so and launched his attack. She turned to make her escape but wasn’t quick enough and had to change her plan, running up a nearby tree. Matt took up straight after them, and after a few minutes of maneuvering, we were able to get in excellent position. We sat there for what must have been 45 minutes or more, letting the sun get lower in the sky. It created simply beautiful light falling across her face. 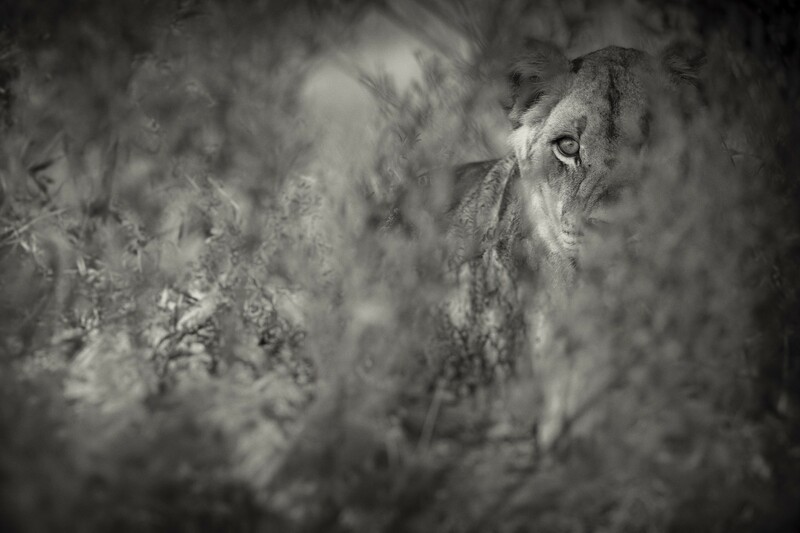 “An Eye Through the Brush” — It was our last day in Duba Plains Camp in the Okavango Delta of Botswana. I never really expect much out of a final half-day, since we can never really explore deep into a territory when we have a flight to catch. But today, luck was on our side. We could still see camp when we found a large male lion along with two females. They were a rowdy group. 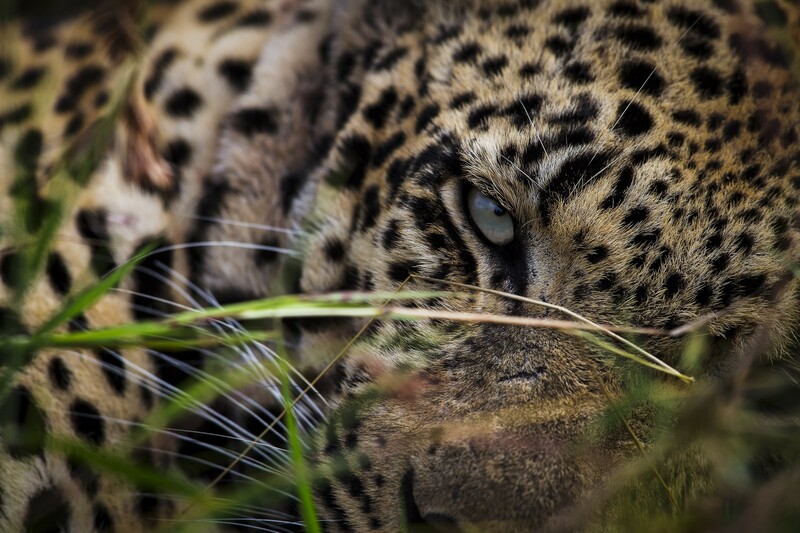 The females would trounce off ahead and he would pause, watching as they chased each other through the open without a care in the world, scaring off all the other wildlife in the area. We followed those three for well over an hour before they started to settle down. The two females seemed to have given their male the shake and were lying beneath some brush. He could still be heard roaring in the background, hoping for a response. After a few minutes one of the females sat up and it almost seemed as if for a moment she realized we were there. It felt as if she looked right at me and snarled. What a moment. EvH: What about these makes them spectacular, or lucky, or rare? CF: For me, such intense eye contact with the subject creates a very traditional portrait look. The photos share many common threads with my earlier street photography. They are quiet moments, nothing that most would consider exciting or adventurous in wildlife terms. They are simple, delicate moments. 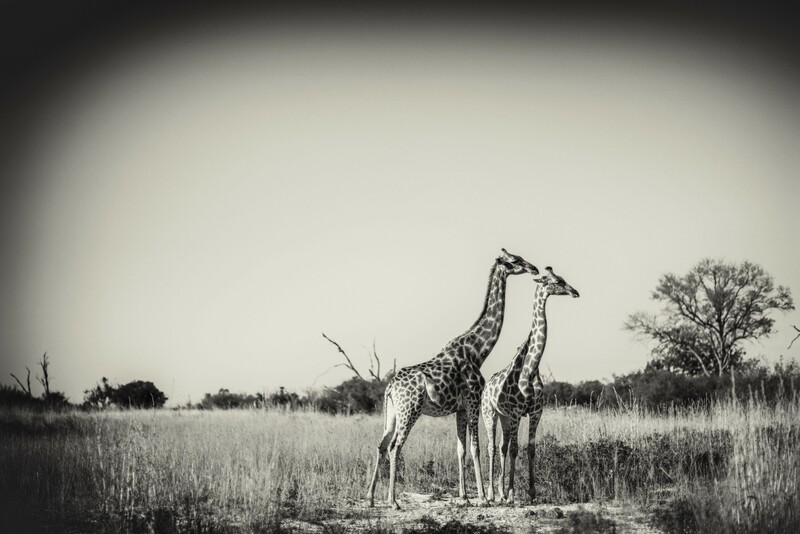 I love trying to capture a humanistic side to that wildlife. Deep eye contact is often very effective, but things like posture or expressions can be as effective, and when you throw them all together, I find those images magical. Photographing a lion as he watches the sunset, or an elephant posturing to size us up, each of these things has a very real emotion I think we can understand as humans, and it creates a beautiful moment. 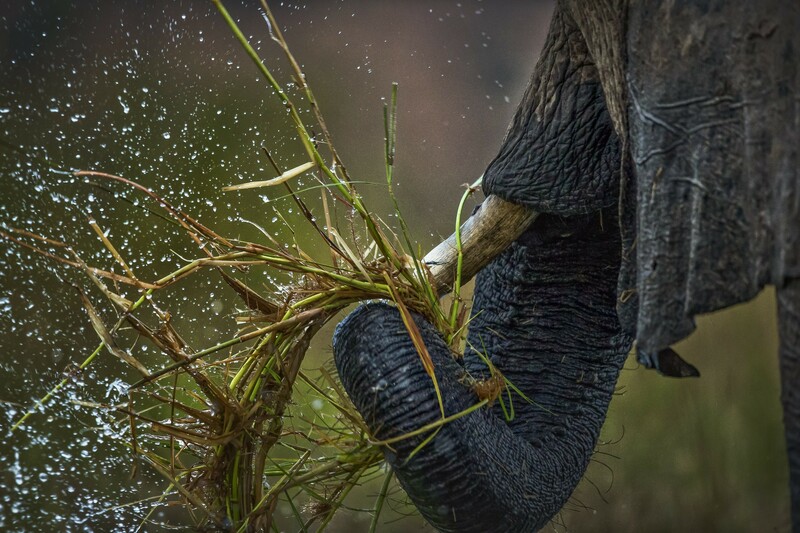 EvH: Wildlife photography is different from other genres in several ways, but first of all the viewer imagines that the photographer possesses some survival or wilderness skills — can you share any anecdotes or interactions from the course of this project (or your career more generally) that put those skills to the test? CF: Nerves of steel do help, but they are not an absolute necessity. A cool head and good decision-making skills are much more important. Most of the time, when photographing, I tend to avoid undue risk. It’s typically downtime that can get you. 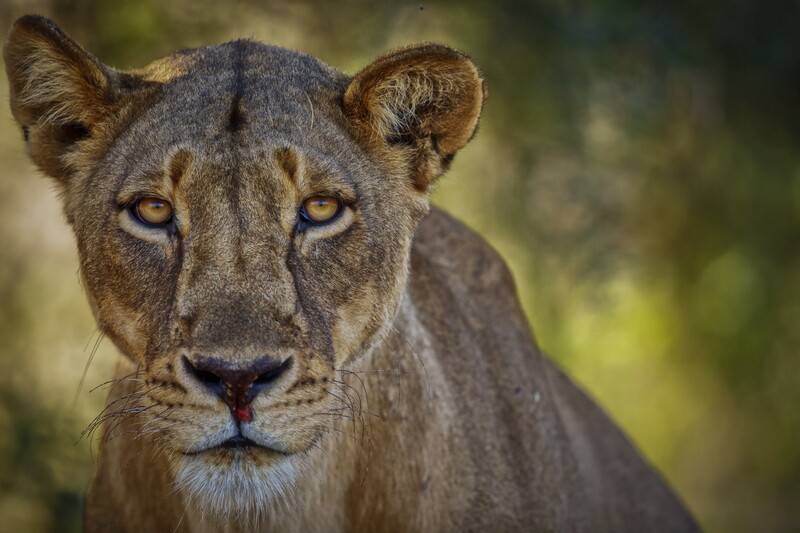 Last year, eating breakfast around the camp fire, we had a male lion chased through camp by a much larger male lion, they crossed about 50 feet from where we were eating. A few days later I woke up to a hippo leaning up against our canvas tent. I have had two brown bear mock charge me when I was 18. Each of these situations could have ended much worse if panic had set in. Having a very healthy respect for wildlife is absolutely essential, but knowing not to fear them is almost more important. Fear makes you do stupid stuff; respect helps you make good decisions. Understanding the conditions you are photographing in and how to prepare for that is likely one of the more difficult ones that wildlife photographers or nature photographers deal with. Often when planning you both have to know the terrain as well as how close you can anticipate getting to a particular subject. Gauging these helps you pack the appropriate gear but does not promise that the subject cooperates. And you always need to be ready for changing conditions be it snow, rain, heat, dust, mud, animal mood changes . . . they are all challenging and can prove costly to both time and gear if you don’t anticipate and plan accordingly. EvH: Can you share any lessons that you wish you’d learned earlier, for example? CF: I really wish I had learned earlier in life to simply slow down. Enjoy the little moment. Everyone wants to photograph action, excitement, the next great thing. I like that too, but not as much as I used to. We often forget that there is so much beauty in the simple moments of life; those moments between moments; a break in a fight or the calm before the storm. They feel like an exhale as if you had been holding your breath in anticipation, yet nothing happened. My heart steadies and the world goes quiet. I wish I had learned to feel this earlier, learned to pay more attention to the world around me and let life happen. As for wildlife lessons, the most important thing to remember, no matter how fast you think you are, and how slow that animal looks, there are few animals that you can out run, so don’t try it. It only makes things worse. EvH: What would be the essential items in your camera bag or backpack for a shoot on this project? CF: There is no such thing as an essential item in my camera bag besides a camera body; it is always a fluid work in progress. They are all tools to get something done in one way or another. If it came down to it (and it did in Belize when my main underwater option failed) I can do wildlife photography with a GoPro. We all say it, but it really is true that the camera is only a tool helps us share our vision of the world. Give me a camera, any camera, and I will share a story. But, to answer the question, even to this day, I still struggle with packing correctly. I tend to take a wide range of gear with me. For example on our next trip to Africa in April, I am taking my Canon 1D X with a primary lens (for the action), a Pentax 645Z with 3 lenses (for the wildlife landscape and portraits) and a Mamiya RN67 film camera with two lenses (also for wildlife landscapes and portraits). This doesn’t include the GoPro or the camera dedicated to filming (two lenses). I am tending to lean towards larger prints lately, which means medium format or high-megapixel sensors. The video is becoming an important piece to marketing so capturing high-quality short clips is something I work on constantly. Truthfully, one of the most important accompaniments is my wife. She tends to handle both the filming as well as prepping gear that I need in a pinch. She can save me minutes when I ask for a lens change on a backup camera and all I need to do is turn around and it’s ready. Total life saver. Weight becomes an issue quickly. Lens selection is also important. I try to cover a good deal of focal lengths, but only take one tele lens, for wildlife. The Canon 200–400 is a good choice, yet I do prefer prime lenses for the medium format cameras. I also have a selection of wide angle and standard lenses to round out the pack. I use a flash with my primary camera and carry extra batteries, more batteries, tripod, Wimberley head, extra memory cards, a laptop, and I never leave home without electrical tape. EvH: How long does a typical shoot last? CF: This really depends on the location. Typically no less than 5–7 days for wildlife as sightings vary and landscape can often be really difficult. On top of that there is a great deal of patience in waiting for a good opportunity. It takes time to get a lay of the land then work into a rhythm. Because of all of this, I don’t really like to go out for any less than that. Landscape could be between 1–3 days depending on location. I don’t like to travel far and not have enough time to get the shots that I want. Rarely does a shoot I go on last just hours. It’s much more common for me to spend days. Each day of shooting then consists of multiple shoots within the day which could be between 4–6 hours each. Tracking animals often takes a bit of time which slows down the process. Then, once you find them, you wait for something to happen; it becomes a crazy mix of patience and stress. Often you could be waiting for an animal to turn its head slightly, or maybe something as simple as waking up. EvH: If you could go anywhere to shoot, where would that be and what would that project center on? CF: I would live in Botswana if given half the chance, and I would spend my days photographing lions, leopards and elephants. The landscape is beyond epic. It is beautiful, rugged and widely untouched. 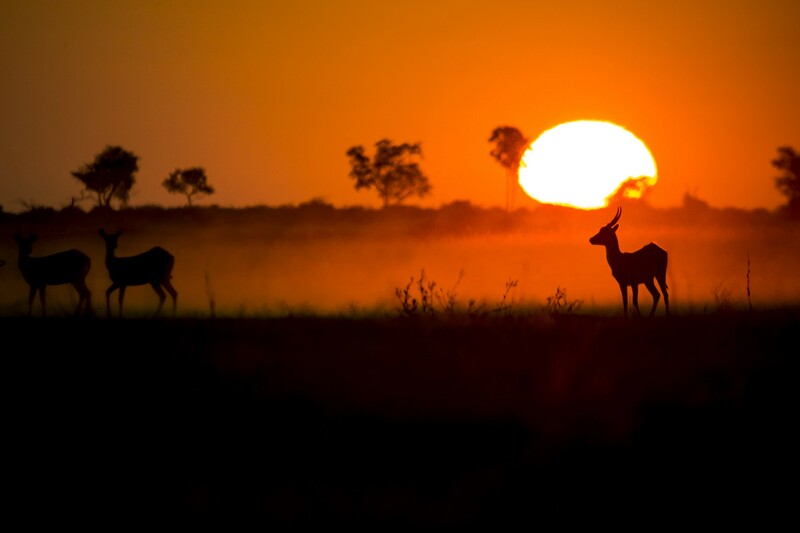 Animals still roam free and know little of being hunted by humans, as it is mostly outlawed there. The work would focus on the beautiful balance of wildlife and landscape. This is a place where large animals still roam as they did hundreds of years ago, and are as much a part of the landscape as the rivers and trees. To me this is such a beautiful concept and I would love to pursue a project that highlights that in the near future. 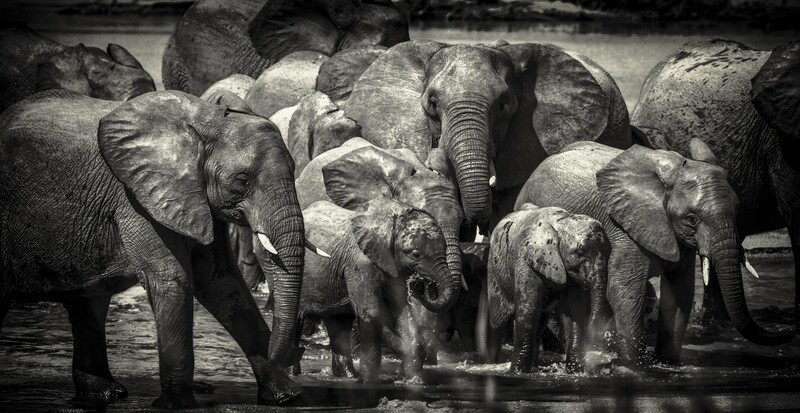 Chris Fischer is an Oregon-based photographer. Follow him on Instagram and Twitter.